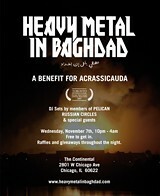 The latest installment in the story of Acrassicauda, the Iraqi metal band who are the subjects of the documentary Heavy Metal in Baghdad: My last post on this was about a fund-raising effort to get the band, now part of the gigantic and growing Iraqi diaspora, out of Syria, where they were in danger of being deported back to the war zone. Over $13,000 has been raised so far, enough to get them safely to Istanbul with a little money in their pockets. But the cost of living there is high (my mom, as it happens, is in Istanbul at the moment, and her e-mails are full of laments to this effect) and they're still at risk of deportation. You can make donations through the documentary's Web site, but if you'd like to help in a more social way, there's a benefit tomorrow night (Wednesday) from 10 PM to 4 AM at the Continental, 2801 W. Chicago. 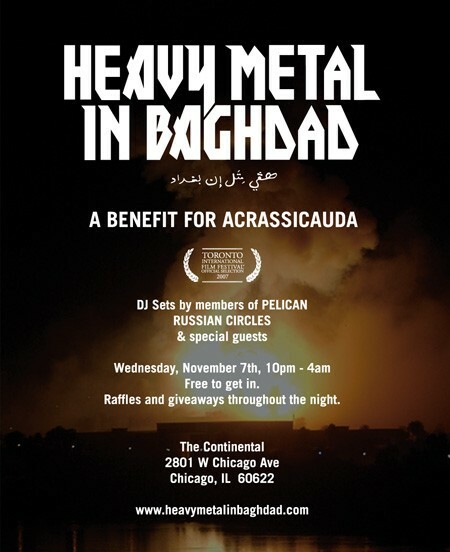 There'll be raffles and giveaways, and members of Pelican and Russian Circles will DJ what promises to be two heavy sets. Surprisingly, there's no cover to get in, so dig as deep as you can into your pockets once you're there.